In 2007-2008, during the second year of the World House Project, the IwB partnered with the Costa Rican Ministries of Culture and Housing to look at rural renewal in the developing Guanacaste region. A major component of this project was to address the lack of viable and sustainable housing for local people, including families as well as migrant workers drawn to the region because of tourism. For the IwB, this was an opportunity to further explore its work and research on housing typologies and needs across the world. In November 2007, the IwB, in collaboration with Building Magazine, put out an open call competition to students and professionals around the world with the challenge of designing a house for the Guanacaste region. Through an online charrette, the IwB received 45 different entries. 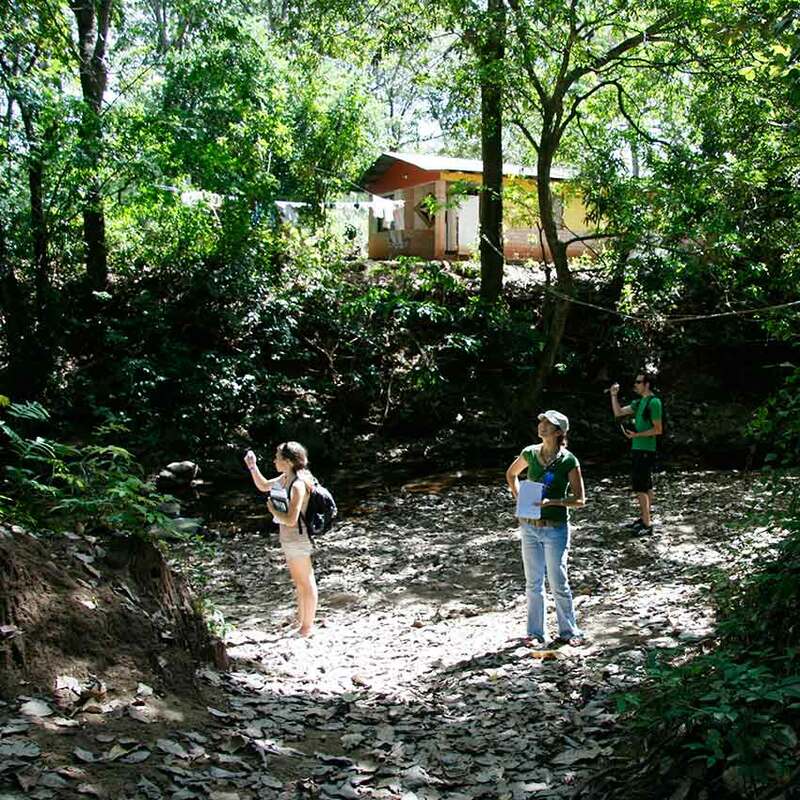 The results of the competition were further developed by the IwB students during their stay in Costa Rica, which included the a Community Charrette with the local inhabitants. Finally, the housing design for Guanacaste was further revised during the 4-day international charrette held at the IwB in February 2008. The design process of the Guanacaste House is outlined in the World House Costa Rica book and in Building Magazine. 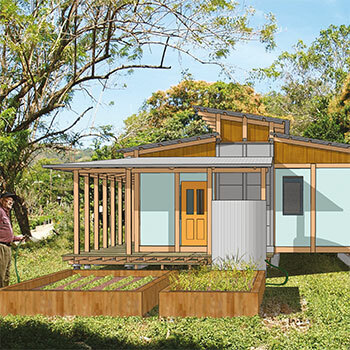 The challenge was to design appropriate housing for Costa Rica’s rural northwest province of Guanacaste, a region that suffers from water shortages and lack of adequate and affordable accommodation for its residents. The design for the social housing prototype had to address the growing population in the region, accommodate the needs of local families and provide temporary accommodation for migrant workers. The Costa Rica house must resonate with the natural conduct of the Guanacaste residents. Infusing the house with the local culture may be the biggest design challenge. Accessibility and durability of housing in rural Costa Rica has been a long-term issue. Throughout the country’s rural areas, there are many self-made houses that are left unfinished because local communities cannot afford established construction methods. What is need is construction that is small scale, affordable and responds to the life cycles of the rural areas and their people. Through the online competition, the IwB received 45 entries from participants around the world. The winning entries were published and reviewed in Building Magazine. The competition was revisited during the IwB’s international charrette, in February 2008. Over a 4-day period, the IwB, GBC Architecture Technology and French and Italian students (from visiting institutions) proposed further design concepts for the Guanacaste House. Throughout 2007-2008, the IwB collected and developed different iterations of the Guanacaste House. All the proposals promoted scalability through modular systems and responsiveness to the climatic, economic and cultural context. Importantly, the designs highlighted that it was possible to build houses within the government subsidy, making the houses affordable and accessible to locals. The final design is featured in the IwB’s World House Costa Rica publication. Making many versions of the Guanacaste House, by creating and open competition and through the Community and International charrettes, produced many excellent proposals, but also some unintended results. Mike Dole, an industrial designer working with the IwB, suggested bringing the project to the Elizabeth Simcoe Junior Public School, where he was a parent volunteer. Dole proposed the IwB explore housing design for Costa Rica with the school’s kids. The children reached to basic encyclopaedic knowledge and began studying the people of Costa Rica and the country’s climate and geographic conditions. The kids researched and imagined a house that could withstand earthquakes and volcanoes. Ironically, their designs, unlike the 45 professional proposals, were the only ones to focus on housing that could withstand the full diversity of the Costa Rican climate. The exercise underlined the IwB’s core belief that diverse intelligences are critical to the design process. Too much cohesion in a group can produce the trap of similar solutions. By including expert and non expert perspectives in the design process, there is more likelihood of holistic design solutions. Learn more about the Costa Rica House in the World House Costa Rica publication and in Building Magazine. Also read more about the Costa Rica project on the IwB project page. The first Place for the Guanacaste House design went to Team 10, who proposed a scalable pattern for the social environment of the house composed of four living units around a central square. Each of these homes is built close to the property line, with exterior walls of concrete. Inside, the interior walls are open and made of bamboo, a local, readily available material. The house features defined public, private and semi-private spaces. The IwB continued its relationship with the Costa Rican Ministries of Culture and Housing into the 2008-2009 academic year. 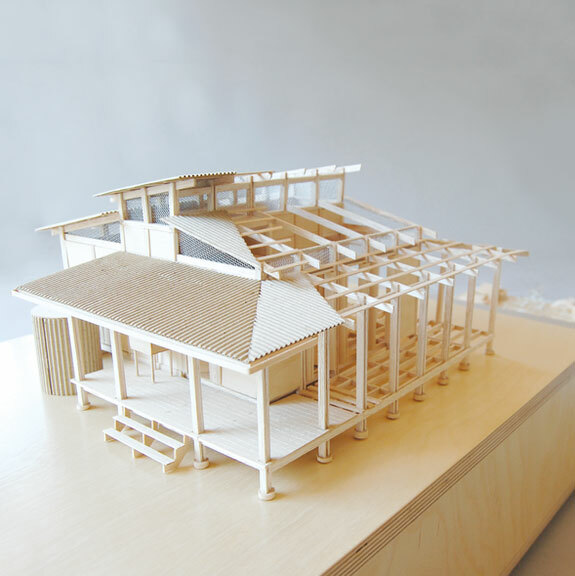 One of the results of the ongoing collaboration was a special model made by Sisley Leung of the proposal for the Guanacaste House. The model was exhibited in Canada to showcase the IwB’s work on the Costa Rica project. It features the single unit house design, but also the variations the house can take on a typical Guanacaste street. The street model shows how the house can grow with the family.